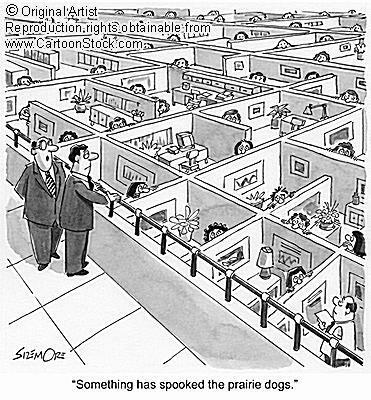 One thing I hate about the cubicle environment is “Prairie Doggin’.” This is where people will pop their heads over or around the cubicle walls, much like a prairie dog popping out of his den. Except in the office, people will do this ambush-style. There is nothing worse than looking up and seeing a pair of eyes staring back at you. We really need to learn a little etiquette in the workplace. Just because my cubicle does not have a door on it doesn’t mean that you have the right to just walk right in any time you like, or just begin talking to me while I am on the phone, or in the middle of something. It is extremely rude. If my office had a door, people would never think of barging in to a closed door. One day, when I was working at The Company, I realized just how small my cubicle actually was when someone entered it (without me realizing it – I can get VERY engrossed in my work) and ambushed me with a hug attack. I flipped my lid. Fortunately, it was a very nice guy who was a little slow, and therefore was not viewed as a threat. After that, I put up a mirror and thought about adding a motion detector or some kind of cow-bell alert system to keep that from happening again. Shortly after this incident, I moved into a much larger cubicle that was completely open on one side. The downside – it had a window that looked into the cubicle in front of me. How stupid. Now, it was like watching the Prairie Dogs at the zoo through one of those underground bubble viewers where you are actually inside the enclosure. Every few hours, I would be shocked stupid to see Mandy’s face appear suddenly through the window to ask me a question (usually whether or not I had her Mary Kay products in stock). Interestingly enough, at Christmas time we decided to scrapbook our cubicle walls in order to win the annual decorating contest. I covered the window and it stayed covered for the rest of the year. Coincidence?? Doubtful.